Sakineh Mohammadi Ashtiani is free! Photographs of an Iranian woman sentenced to death for adultery, Sakineh Mohammadi Ashtiani, have been released, but without any official confirmation of a report that she has been freed. The images, released on Thursday by the Iranian state-controlled Press TV, show Ashtiani while on home leave last week. The International Committee Against Stoning (ICAS), a German-based campaign group, says the photographs suggest Ashtiani has been freed. Patty Debonitas, a spokesperson for the committee, one of the main groups which campaigned on behalf of Ashtiani, hailed the reported release a “historic” victory in an interview with Al Jazeera on Thursday. “It’s a historical success because the international outcry worked,” Debonitas said. State television in Iran denied reports that a mother of two sentenced to death by stoning had been released. Earlier rumours that Sakineh Mohammadi Ashtiani, whose case sparked a massive international outcry and calls from celebrities that she be released or her sentence commuted, would be freed prompted jubilation around the world. Early Friday local time, government-owned Press TV released a statement saying Ms. Ashtiani had been taken home to film a special in which she would confess to murdering her husband and show the scene of the crime for a TV special. “Contrary to a vast publicity campaign by Western media that confessed murderer Sakineh Mohammadi Ashtiani has been released, a team of broadcast production team with the Iran-based Press TV has arranged with Iran’s judicial authorities to follow Ashtiani to her house to produce a visual recount of the crime at the murder scene,” the broadcaster wrote. The “Iran Today” program, said it would broadcast its report on Ms. Ashtiani’s case Friday evening and over the weekend. 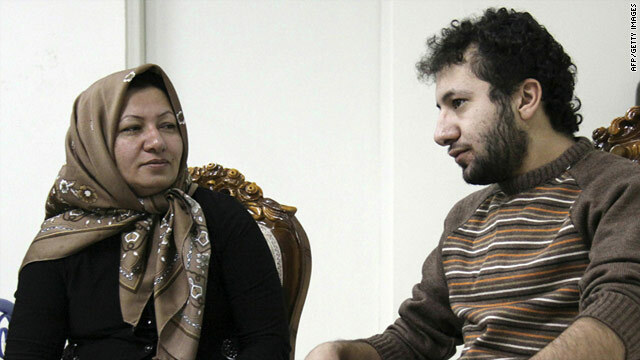 Is or will Sakineh Mohammadi Ashtiani be free? Who knows? Knowing how cruel and diabolical the Iranian government is, I doubt it. It’s evil enough that the Iranian government sentenced a women to death by stoning, for adultery, but what kind of sadistic government forces the condemned to confess and reenact the crime, which may or may not be coerced, on State TV? What manner of barbaric voyeurism is that? If you were ever wondiering who was the king of the dumbasses, I think we have a winner. Implanting a camera in the back of his head as part of an art project may have granted a New York University photography professor, Wafaa Bilal, a certain notoriety in the last several weeks, but it has robbed him of something else: dinner-party invitations. Concerned about the intrusion of his head-camera, which is rigged to broadcast online a live stream of images snapped automatically at one-minute intervals, some of Mr. Bilal’s acquaintances have removed him from their guest lists, he said Thursday in his first newspaper interview about the project. An assistant arts professor at NYU’s Tisch School of the Arts, Mr. Bilal was commissioned to implant the camera for the period of one year by a new museum in Qatar. The museum, Mathaf: Arab Museum of Modern Art, will also display a live stream of the photos when it opens Dec. 30. New Video Of Cyborg Professor With a Camera on the Back of His Head! I’ll bet $100 that he’s an Obama voter. NASA shoots, they score! That’s pretty awesome photography, considering the speeds and distances involved. After a nearly 2.9-billion-mile (4.6-billion-kilometer) voyage, NASA’s EPOXI mission spacecraft has survived its risky rendezvous with comet 103P/Hartley 2 and has beamed back the first close-up images of the comet. This montage of five pictures, for example, shows Hartley 2’s nucleus as the craft was flying toward and under the icy body on Thursday. The images progress in time clockwise, starting at top left. 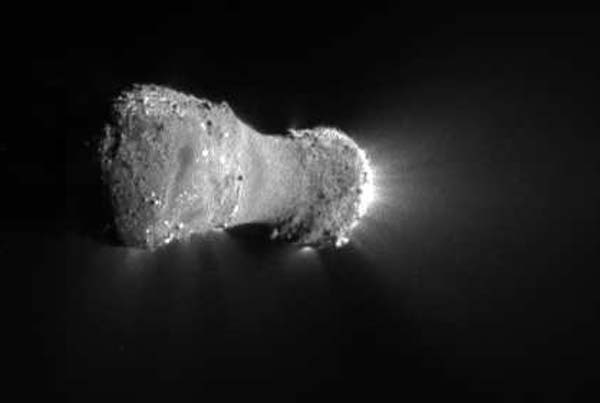 “Early observations of the comet show that, for the first time, we may be able to connect activity to individual features on the nucleus,” Michael A’Hearn, EPOXI’s principal investigator said in a statement. “We certainly have our hands full. The images are full of great cometary data, and that’s what we hoped for.”. The vessel EPOXI, previously called Deep Impact, traveled 2.9 billion miles into space and captured images 435 miles away from the Hartley 2 comet, which was traveling at a speed of 27,000 miles-per-hour. Scientists say the photos of the icy body will provide them with new and useful information about comets. Unlike most government spending, which is usually wasteful, it’s nice to see NASA getting the most bang for it’s buck by thinking out of the box and retasking its spacecraft to perform missions that weren’t originally contemplated.